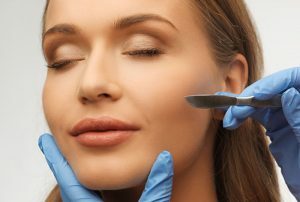 Dermaplaning is a method of exfoliation that consists of using a 10 gauge scalpel to gently scrape off the top layer of dulling dead skin cells in order to reveal a smoother, brighter complexion. It also removes the downy hair from the face which laser treatment cannot accomplish on blond or red hair. Dermaplaning leaves the skin looking smooth as silk with a fresh canvas to apply make-up on. Will not cause hair to grow back with a shadow or stubble but actually helps to make it less apparent. Dermaplaning can be done in conjunction with a light lactic acid peel, glycolic peel , or enzyme peel. Oxygen can be infused at the end of treatment for hydration and plumping of the cells with specially prepared skin cocktails for your skin type.